Universiteit Maastricht (abbreviation: UM) (or in the English language: Maastricht University, founded in 1976, is the second youngest university in the Netherlands, and consistently ranks among the top universities in The Netherlands in terms of education. 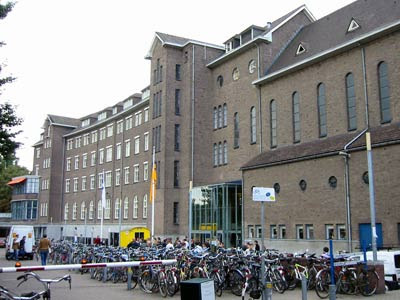 Maastricht University has about 11.500 students, 30% of whom are foreign students, and 3000 employees. The university is renowned for its Problem-based learning method as an innovative way of teaching. About half of the bachelors programmes are fully offered in English, while the other half is taught in Dutch. Most of the postgraduate programmes are in English. The history of the development of Maastricht University has been a major factor in the distinctive profile that has emerged during the course of the years. The shortage of training opportunities for prospective doctors in the Netherlands in the second half of the 1960s prompted the need for an eighth medical faculty. Maastricht was one of several cities to express a firm interest in housing the faculty as part of a future university. At the time, the South Limburg region was in need of economic restructuring due to the closure of the mines, a fact that served to increase Maastricht's chances in the race for this new faculty. It was clear that the Dutch academic world expected more from a new university than merely a number of additional university places. Those initiating the Maastricht bid opted for a brand new system of education: PBL (Problem-Based Learning). Moreover, medical research would not only be of a clinical nature, but would make a huge contribution to the accrual of knowledge for general practice and other primary medical care functions. But things very nearly went wrong. The shortage of medical students had been resolved by the early 1970s, and in 1974 a decision was made to launch programmes in medicine in Maastricht before official approval had been granted. The legal basis followed in late 1975, and Maastricht University (then known as the State University of Limburg) officially opened its doors on 9 January 1976. UM grew at a rate of knots. Initially thanks to political support, and later as a result of the conscious decision to deviate from the university growth model then prevalent in the Netherlands. Maastricht University decided to shift its focus from the Netherlands and to concentrate more on European-based programmes (such as International Business Studies, European Law School, European Studies and European Public Health), and programmes as yet unheard of in the Netherlands (for example , Knowledge Engineering and Arts & Social Sciences). Thanks to developments like this, UM can now justifiably claim to be a medium-sized university according to European standards. Whereas until quite recently quality and growth were inextricably bound up with each other for UM, during the next few years quality and internationalisation are the aspects that are expected to feature more strongly. Education and research will concentrate on three main angles of approach: Life Sciences, Innovation and Governance. Students and staff will study these socially relevant topics in an international context, with an emphasis on the European perspective. Unique programmes of education, within the context of a finely tuned PBL model, and well-considered, streamlined research lines UM will secure a place in the European top for the coming years come. Both international and (Eu) regional collaboration with other organisations and institutions will also play an important role. H&G Maastricht Brain & Behaviour Institute. The Times Higher Education Supplement (THES) university ranking: place 111 in 2007; 172 in 2006. In the category foreign students, Maastricht University scored 99/100 (cf. Harvard 91/100). Dutch Ministry of Education, Culture and Science (OC&W): In 2004, Maastricht University was ranked first (of all Dutch Universities) in a report on quality of education (press release). In 2005, the university came in first again. From 2006 onwards, the ministry no longer publishes a ranking list. Econometrics, International Business, Psychology, Medicine, Health Sciences and Molecular Life Sciences). From the other four programmes, three came in second place. Dutch Magazine Elservier: At the beginning of the academic year 2005-2006 the university was once again ranked number one in the Netherlands by the Dutch publication Elsevier. In 2007 many degrees were again recognized as best in the Netherlands with exceptional grades given to the international opportunities in the International Business and Economics degrees. German Magazine Wirtschaftswoche: In 2005, the Faculty of Economics and Business Administration was regarded better than the same faculty at Oxford University. Financial Times: In 2007 the Faculty of Economics and Business Administration (FEBA) participated in the Financial Times’ ranking for Masters in Management programmes for the first time and its International Business programme scores a 28th place in the top 40 of European institutes that offer such programmes: website. The programme even made the 4th place on the list "Best in International Business" and 3rd in the category "Value for Money".